A Stratos is creative, sensitive, caring, open-minded, vibrant, and optimistic. If you too want to cultivate these qualities, you belong at Strate. Our Integrated Master in Design course is the right fit for a creative mind like yours. Unlike other Bachelor’s or Master’s programs, our integrated program offers a comprehensive look into the design industry and hands-on experience for a rewarding career in it. If artistic expression and the manufacture of objects and services appeal to you; if you are naturally creative, curious, imaginative, and are interested in everything under the sun, then you are set to become a designer at Strate School of Design, Bangalore. At Strate, we branch the design admissions into undergraduate (right after Class 12) and parallel admissions (from Year 2). You can enroll in Strate School of Design immediately after class 12 if you are driven by your ambition to become a top-notch designer or opt for lateral admission to year 2. Currently, we are not accepting applications for lateral entry to years 3, 4, and 5. Please note: Students pursuing the course only up to year 3 will be awarded the Bachelor’s (BSc) degree from Jain (Deemed-to-be) University not the French degree from Strate School of Design, Paris. To join the Integrated Master in Design course, please complete the application enquiry form, selecting your area of interest. We will contact you soon after. You can also reach us at (+91) 888-082-0000 or send an email to admission@strate.in. Our goal is to make the world a simpler, more just, and a more beautiful place. We are interested in your ability to transform your drawings into sustainable, useful designs rather than your academic results alone. Since ours is an Integrated Master’s course, you do not have to have a Bachelor’s degree to join. You are eligible to apply to our Integrated Master in Design course if you have graduated Class 12 with an aggregate of at least 50%. There is no entrance exam you have to sit for or pass for admission. 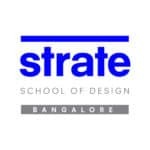 The fees for the Integrated Master in Design course at Strate School of Design, Bangalore is INR 7,50,000 per year. This covers only tuition fees and does not include charges for international study trips, and other miscellaneous fees.